Released in August 2009, Koumajou Densetsu is a doujin game developed by Frontier Aja. The game is a mix of Castlevania based gameplay and a lot of references to Touhou, a popular series of shoot 'em up games. Best easy difficulty time: single-segment 0:15:55 by Daniel 'Axel Ryman' Fitzgerald on 2009-12-25. Hurray as I finally managed to get a Touhou speedrun on SDA! First of course credit to all the staff of SDA for blahblahblah insert generic thing here....I can't think of anything fancy, quiet. Besides I'm not very good with these things. Also credit to Frontier Aja for making this game, and ZUN for creating the Touhou characters(and series itself). 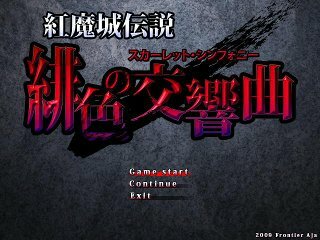 Koumajou Densetsu: Scarlet Symphony(Legend of Scarlet Devil Castle: Scarlet Symphony for the English title) is an old Castlevania style game, which is pretty obvious from the character artwork(sorta), weapons, and enemies, as well as some of the stage locations. For this run, I use the official 1.04 patch from Frontier Aja's site, which allows players to change the language of the text(Originally Japanese) to French or English. As you'll see, I used English. Another thing it allows in the game is to change the difficulty. The only differences in difficulty however is the amount of damage you deal to enemies, as well as the amount you take. Since this is on easy, I take 50% less damage than usual, and deal 50% more. A run on normal or hard would require more dodging than attacking. Cause of this, I went with Easy mode, since I can be a bit more reckless during boss fights so I can kill them faster. As a bonus, I changed the default number of lives from 3 to 1(or 2 to 0, depending how you look at it). This is so it's a more "authentic" Single Segment run. There is also an Extra stage that is unlocked when you beat the game, but I'll talk about that if I do an Extra stage speedrun. Now I doubt many people know much about the game so here are some very detailed comments. If you don't want to read them, then skip to the Run Comments section of these comments. Reimu is a Shrine Maiden of the Hakurei Shrine and the main protagonist of the Touhou series(usually), being feature from the first game to the latest. Her main weapon here is a whip(It could be her staff, or those charms/seals monks/shrine maidens usually carry, I can't really tell) and is also her main damage dealer. She also has a ranged attack where she shoots Amulets, however these use up Souls(The "Hearts" of the game). Her Shrine Maiden hax also allows her to fly indefinitely till hit or till the player cancels it, however once either of these occurs, she can no longer fly. Marisa is a witch who lives somewhere in some woods...yeah I didn't put too much interest in looking this up..anyway yeah she's a witch. Her attire here doesn't look it but she usually wears a regular witch outfit, including the hat, as well as carrying a broomstick. She usually flies around on the Broomstick as well to get around. Here she is a Partner, shooting out 2 large stars that explode when they hit an enemy or have been out for about 2-3 seconds. Marisa joins you before the boss fight at the end of Stage 1. Cirno(Hereby referred to as #9 unless in a case of importance) is an Ice Fairy who inhabits the lake near the Scarlet Devil Manor. She is the "Strongest" in Gensokyo and should be noted that here, its not a misconception(Well it is at first). Cirno is known as #9(9-ball) for the instruction manual for Touhou 9: Phantasmagoria of Flower View, where it lists her as 9: Idiot in it when explaining the in-game mechanics. Besides that however, she isn't very smart. She becomes your 2nd Partner at the start of Stage 2, and is stronger than Marisa, however her attack is slower, but that is insignificant. Her attack consists of her firing a small ice ball which becomes a star, damaging enemies while they're in it. If the ball is on an enemy before changing, the star is bigger and has a larger hitbox. I don't know if there is a strength difference though. Uh....I forgot her name....you know I'm just gonna call her China. much easier. Of course this is a joke that is even thrown into the game. Hong Meiling is her real name, though she has been referred to as Hong Meirin as well, or China due to her clothing, as well as her stage + boss theme in Touhou 6: Embodiment of Scarlet Devil. The reason her name is like that is because her name is confusing. She is the 2nd stage boss and is the Gardener/Gatekeeper of the Scarlet Devil Castle. Saying Gatekeeper though makes you wonder since she's not very good, even falling asleep while on guard duty. Head Maid of the Scarlet Devil Castle, as well as a homage to Jojo's Bizarre Adventure's Dio Brando. Originally featured in Touhou 6, she is very similar to Dio Brando for her excellent control over knives, as well as being able to stop time, and last but not least, having a spellcard in the game called The World, which is the name of Dio's Stand. For this game she is the 3rd and 7th stage boss. There is a running gag with her always throwing a knife at Hong due to her falling asleep while on guard duty, as well as a Pad gag due to official artwork changes between Touhou 6, 7, and 7.5. A puppeteer who can give life to the dolls she makes. Usually seen carrying a Grimoire, she lives in the Forest of Magic(same location as Marisa, but different house). She has a rivalry with Marisa, as well as more deeper feelings. She is the stage 4 boss and has no friends...unless you count her dolls Hourai and Shanghai. A small but powerful oni who resides at the Hakurei Shrine, however came here when Reimu wasn't around to play. She made her first appearance in the fighting game, Immaterial and Missing Power. Usually found drinking Sake, Suika's a small powerhouse and even able to grow 10x her size. This game is no exception because she gets drunk and grows here too; however you won't see it in this run. She is the boss of stage 5. Known as the Locked Girl, Patchouli is a bookworm who resides in the Scarlet Devil Castle's library, rarely ever leaving it. She is physically weak but possesses strong magical powers. Patchouli is similar to Alice in having feelings for Marisa, and is the 6th stage boss. The ruler of the Scarlet Devil Castle, as well as the final boss of the game, Remilia is the female version of Castlevania's Dracula, looking similar to a vampire and being able to turn into a bat as well. Don't take that heavily though, as she doesn't have a full Dracula moveset here. She had the castle built so she could dig for treasure said to be beneath a red castle(From a book she read), not knowing it's not real. She first appeared in Touhou 6 spreading a fog around Gensokyo as, like usual vampires, she cannot go out in sunlight. Remilia is a very powerful opponent however despite this, as she is the final boss in the main game. Yeah this game has a story. Summed up, Reimu notices a scarlet mist so she heads to find the source of it, eventually finding the castle. She encounters all the above characters, and when meeting Remilia, she learns that she was lured there on purpose to help with Remilia's plan: to excavate buried treasure. Remilia read in a book of a treasure that lied beneath a red castle, and she spread the mist as it must be excavated during daytime. Before she follows up her plan, Reimu interrupts. She says the treasure is only a legend based on the "Red Mountain Castle" on Mt. Akagi, and the treasure doesn't exist. It's only a legend from the outside world. With the incident now solves, Reimu proceeds to leave. Just then, Remilia changes her plan, saying she lured them to the castle so they can fight under the scarlet moon. Reimu and Remilia battle. Remilia is defeated, but she orders Meiling, Patchouli, and Sakuya to attack them. After they are defeated once again, Remilia once again fights Reimu. After the struggle, Reimu and her party are victorious. With the incident solved, they all have a party back in the Hakurei Shrine. Oh and Remilia actually shouts "WRYYYYYY"(another Dio Brando reference) before the first fight. You may get lucky to see even though I skip the text. Alright time for the actual comments. Here though I'll give you the controls(In case people are interested) as well as a small explanation for them and game mechanics+tricks used. Like some of the Castlevania games, you can attack faster by shorthopping into the air, attacking, land, then repeat, which is faster than normally attacking. While ducking, or even jumping, the hitbox for the whip is greater than just standing. While above an enemy, I have hit them with the whip, having it look like I missed. It's also possible to hit enemies directly above you. Before, sliding was down by pressing X mid-slide, but was changed in a later patch. At the same time, it wasn't as abusable before. In this run, you'll see me slide directly under enemies, specifically in stage 3. As mentioned before, you can fly around indefinitely till hit or you cancel the flying. Once you do however, you will fall till you land on the ground, or die. One area in stage 2 is dangerous because of this since if I get hit I have to start over. Also, if you go too high or too low in some areas while flying, you'll be attacked by a Red Star, which homes in on you and deals some damage. When you take a hit, it can be either a normal hit or a "critical" hit. Critical hits have a different sound when you get hit, and obviously deal more damage. Some later enemies will deal critical hits with their attacks, including 2 stage "gimmicks" as I currently call them. I'll mention them when we get to it. The score at the end of the stages isn't like the old style where they count up everything, so I don't have to worry about it. You DO have to pick up an orb after defeating the boss however, but it takes about a second to grab it after it fully forms. When you begin a stage, you start at full health with the amount of lives you had before and 50 souls, regardless of how many you had previously. You can return to title or get a game over to start with the default number of lives. Bosses follow a set pattern, using a few small attacks and then a stronger attack(Spell Card). This pattern then repeats. Alright now time for the run itself. This is the main stage that made me reset the most, as I prefer a "perfect" stage 1 or else it's not good enough for me. First area is simple sliding, 2nd area was a little different to how I usually do it, but it's just as fast nonetheless. 3rd area is good, as is the 4th. 5th is the one area that is a bit random for me; however I managed to get through without taking a hit. #9 is typically easy of course. I get Marisa here so I first start out with using her. There's a small period of time before I can actually hit her (As well as every other boss in the game), so I make sure the Star hits her once she's vulnerable. I took the hit near the end on purpose to give me a bit of air to hit her again. I also missed her once during her Perfect Freeze so I lost about a second or two. For non-speedrunners: The green statue in the 5th area will give an extra life if you hit it enough times. 1st area wasn't too bad, though I did a bad slide. 2nd area is the part I mentioned before about flying. If I go too low, the Red Stars will hit me. 3rd area had a bad mistake where I hit a toad, and even had to fly up from a pit. Hong Meiling went well, and exactly how I wanted. If I had her go left with her kick, she would of made the fight longer. For non-speedrunners: At the end of the boss battle, you'll see a pot with a lot of souls. You can get there by flying before Hong shows up, which will get you an extra life. I made a speedrun video of the demo, which was okay in my eyes now that I look at it. It didn't have the sliding abuse I did in the 1st 3 rooms. The 4th room was fine even though its not what I usually do, if anything it probably was a little faster, or same amount of time. Room 5 went well, but 6 I had a bad brain fart. Room 7 and 8 had more sliding, 9 was fast, and 10 I did some minor mistakes. The last room before the boss also had 2 small mistakes, but still good in my eyes. Sakuya went down fast thanks to #9. Actually killed her before her spell card went off, but I made a small screw up grabbing the orb though. For non-speedrunners: In the first stairway room(The room before the spikes), the top right platform is fake and hitting it will give an extra life. Stage went nice. Room 2 I took a bad hit, room 3 had a good fall, room 5 may seem a bit slow but its to make sure I don't get hit. Room 6 I took 2 hits but it was good. Alice went good. Besides a small mistake at the beginning with #9, I killed her before the end of her 3rd attack. For non-speedrunners: Room 6 has an extra life in the top right. The guillotines are critical hits, and are one of the stage gimmicks, however it's only in the 1st room. Room 3 was a bit slow, room 4 had an unneeded hit, as did room 5 and 7(with 2 each for both of them). Room 8 I get the roast for healing. I'd have to get one either way so getting it then was fine. Room 10 was a bit eh from my usual attempts, and Room 11 I was being careful so I wouldn't need the roast in room 12. I made sure to kill Suika before she used her spell card, cause if she used it I would immediately restart, as she is invulnerable. For non-speedrunners: There is an extra life somewhere but I forgot where. For everyone: I hate the Werewolves...thank God this is the only stage they're in. Clever note: You can see a Triforce on Suika's 3rd attack. The library was known to be one of the worst places to play cause of lag from the game. Later patches however fixed it so it's a lot less laggy. Main gimmick for this stage is books that fire bullets. They're easily dispatched though. AH FLEAMAN!! Room 1 and 2 were good, 3 would have been better without the slide into the skeleton. The fairy hit was somewhat intentional, as I'd take a hit either way. Room 4 had a small amount of trouble with getting the food for healing. Room 5 had a nice dodge, Room 6 had an intentional hit, Room 7 could have been a bit better, Room 8 was good, Room 9 is good(And reveals a extra life). Stages 10 and 11 were okay too. I grabbed the rice ball (Or Donuts if you saw Dubbed Pokemon) as a backup. Patchouli's books aren't threatening, but her attacks themselves are. In Hard Mode, you die in 2 hits unless you dodge. Normal is almost the same thing, maybe 3 hits, but barely. It's the main reason I grabbed the rice ball, as a just in case measure. Here I kill her before she uses Philospher's Stone. This is the worst stage in the game to speedrun. The stage itself is more of a threat than the enemies. 1st room wasn't too good, 2nd room I screwed up as well, 3rd wasn't too bad, 4th was forgiving, 5th was a little slow, 6th was good, and 7th you can see why I get more cautious. I seriously thought I died there too. 8th had a small mistake near the end, as well as 9th, but 10th went well. 11th got me a bit worried, since a previous attempt had me die at Sakuya. She's a bit harder this time. I try not to take too much damage, but screw up near the end when she's almost dead. For non-speedrunners: In the first room after being outside, one of the 2 spinning things contains an extra life. Grab it while you can before it falls into the spikes. Stage 8: Bloodlines...wait no...uh The end? Not much to say. There are more things at the top like an extra life and souls but that's it. The battle went well, besides her going too high up, however I managed to save most of my health, which is good. Hong Meiling 2: Went down fast and I managed to grab the healing + souls in time. Patchouli 2: Fastest I ever had with her. She didn't even use her first attack so...bonus? Remilia 2: Getting stuck in that corner doesn't help with Cirno so I had to switch, however it helped so I could whip her faster. I managed to kill her though. Final time based on when I have control and when I collect the last orb: 15:55. I doubt you read all that but if you did, wow seriously? You deserve a cookie. Audio commentary is a bit similar to this, but has less mentioning due to the amount of time and such. I think I said the run was about 16 minutes there, but I was probably counting the times after receiving the orbs in each stage, so it's probably under 16 minutes if you count that.